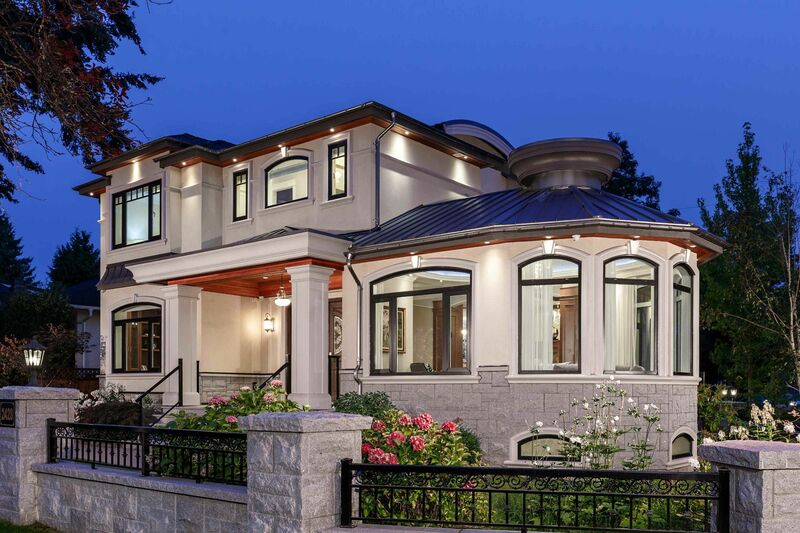 MAGNIFICENT BEAUTIFUL CUSTOM-BUILT HOME IN MOST POPULAR ARBUTUS Location. STEPS away to TRAFALGAR ELEMENTARY. CLOSE to PRINCE WALES HIGH SCHOOL, YORK HOUSE, ST. GEORGE’S & CROFTON PRIVATE SCHOOL, UBC. TRANSIT. This home simply offers Luxurious over 4,800 sq.ft. Mansion sits on PROFESSIONAL LANDSCAPED. BIG LOT 7,565.74 sq.ft. Total 7 bedrooms & den, 6.5 baths. Grand foyer with High ceiling open onto living & dining, entraining sized family room over looking PARK- LIKE GARDEN BACKYARD. Gourmet kitchen with high-end cabinetry & appliances. Huge Center Island counter top. WOK KITCHEN, HOME THEATRE, WET BAR, STEAM BATH, SAUNA, RADIANT FLOOR HEATING, A/C, HRV. Potential 2 bedrooms suite as mortgage helper. Secured yard with SOUTHERN EXPOSURE. EXCELLENT PRICE IN WESTSIDE. MUST SEE! 溫西ARBUTUS區環境優雅豪宅。眺望山景，朝南後院。入讀著名PRINCE OF WALES中學，TRAFALGAR小學，近著名YORK HOUSE, CROFTON HOUSE和ST.GEORGE’S私校，UBC。地大 7,565.74呎，室內面積约4,825呎。共7房 +書房，6.5浴。華麗豪宅採用精細做工，搭配設計尊貴宏麗，高挑樓底，雙面燃氣壁爐，大氣門庭氣派帶領進入䦕放式格局客廳和飯廳。美味開放式廚房及中廚配搭高級廚具和電器。華麗的主臥浴室選用花崗岩配蒸汽淋浴，奢華感十足！地庫擁有客房、電影院、酒窖、酒吧、桑拿房、活動室等。豪宅配地熱，中央空調，清新換氣系統及高級保安系統。尊業園林公園般花園，私密性極佳，美麗後院可作休閒憩靜，能共醉良朋！ 購物交通方便，請預約!